With the dry heat of the Arizona desert, Phoenix is one of the best places to build a backyard pool. A pool of any size or depth will turn your yard into an oasis of life and fun, and while the temperature may drop like a stone at night, especially in January, pool season never has to end when you live in Phoenix. And when you decide to build that backyard pool or renovate its design, you should call No Limit Pools and Spas, the best pool builder of Phoenix. When you get right down to it, a backyard in-ground swimming pool is just a hole in the ground surrounded by concrete and surfaced with plaster, fiberglass, or tile. There’s nothing that says it has to be so big around or so deep at a certain point, and while you have to be careful about avoiding buried pipes and cables there’s nothing else to decide how to build your pool except for you. If you want a shallow pool that’s kid-friendly but deep enough for adults to play around in and swim laps, No Limit can make that happen. If you need enough depth to jump in safely and practice swimming underwater, we can do that, too. If you want something unusual like a thin pool for swimming laps or one with a shallow end at either side, if you live on a hill and you want an infinity pool that feels connected to the landscape, then we’re the pool builder of Phoenix to contact. With all the heavy equipment it takes to install a backyard pool, the process can do a real number on the state of your backyard. Replacing what gets damaged is part of the process and the price, but many of our customers take advantage of the opportunity and redesign their backyard from the ground up. If you really want your pool to be a backyard oasis, we can bring in a garden of plants to make that dream a reality. There are plenty of beautiful and hardy leafy plants and succulents native to the American Southwest that need little to no extra care from you. We can also build some people-friendly additions like covered patios with built-in speakers or an outdoor kitchen. When it comes to backyard plans, No Limit is more than just a pool builder in Phoenix. At No Limit, we don’t just offer amazing pool and backyard design options. We also have some of the most modern pool technology available from any pool builder in Phoenix. 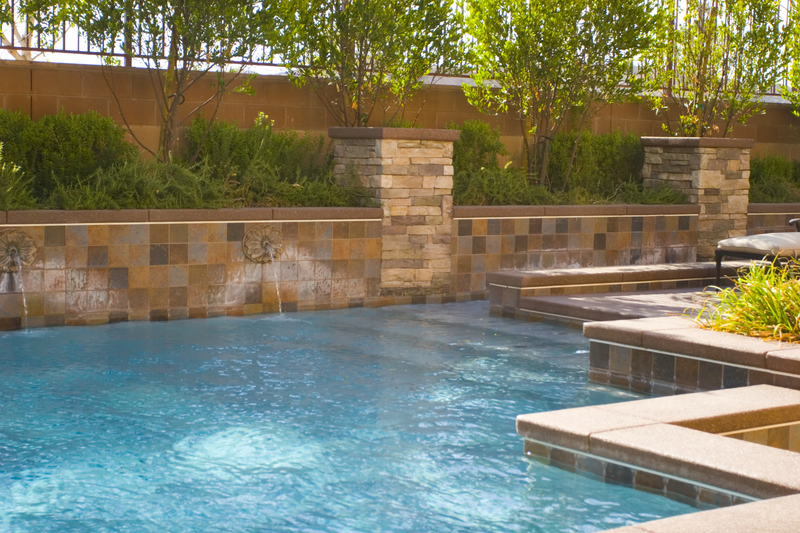 Modern conveniences can take a lot of the busywork out of cleaning and maintaining a pool. A chemical sensor can not only track things like chlorine levels and the pH balance, it can also come with pods that automatically release the right chemicals into the water to keep the balance perfect, plus it can automatically send an alert to your phone when it needs refilling. A robotic pool cleaner can scrub the sides and skim the surface for leaves and other debris so you don’t have to. You can also get some extra pool equipment that will let you use it even on the coldest days of winter. Pool heaters come in a lot of sizes and strengths, which means you can customize how much you want to spend based on how often you want to use your pool at night. Heaters can run on electricity, gas, or solar energy, the last of which is a popular choice in a sunny town like Phoenix. You’ll also want colored LED or fiber optic lights for enhanced mood lighting and possibly even light shows. Swimming pools and spas are popular backyard accessories in Phoenix, Arizona. Dry heat may sound appealing to someone who lives where it gets humid a lot, but it can get old quickly and it makes a dip in a cool pool that much more appealing. So if you live in Phoenix or one of its eastern suburbs like Gilbert, Chandler, or Mesa, you should contact No Limit Pools and Spas to schedule an initial in-home consultation and find out what makes us the best pool builder of Phoenix.